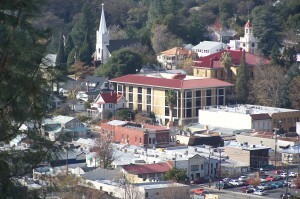 The site is located in Sonora, California and is currently being operated as an automobile repair facility. In 1999, three gasoline underground storage tanks (USTs) and one diesel UST were removed. Soils beneath the former USTs, product lines and dispenser islands were over-excavated at this time due to gas and diesel odors found in impacted soils. In total, it is estimated that about 1,600 cubic yards of impacted soils were removed at this time. Later that same year, three monitoring wells were installed around the site to determine if groundwater had been impacted. Quarterly groundwater monitoring was conducted at the site from 2000 to 2002, when the consulting company at the time submitted a request for No Further Action. This request was denied by the California Regional Water Quality Control Board (CRWQCB), and groundwater monitoring resumed in 2009. In 2011, E2C was asked to prepare a Workplan for a Shallow Soil Vapor Survey at the site. In the First Quarter 2012, the Soil Vapor Survey was implemented. Six shallow vapor wells were installed at the site, and analytical results from the survey indicated that no contaminants of concern were above their respective environmental screening levels. In 2014, the CRWQCB issued a No Further Action Required letter, stating that due to tank removal and excavation activities, as well as subsequent groundwater and shallow vapor monitoring, the residual contamination beneath the site would not pose a risk to human or environmental health.